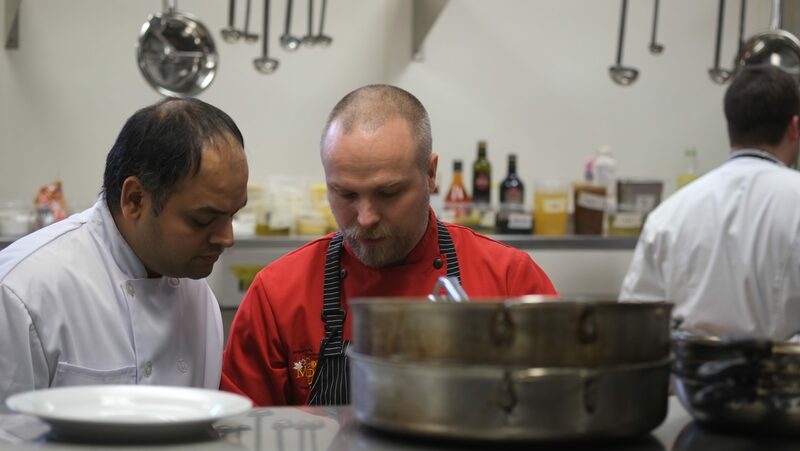 Eleven Canadian chefs from eleven Canadian cities converged in Kelowna, BC this past weekend and cooked their hearts out. Ottawa’s competitor, Patrick Garland of Absinthe Cafe didn’t end up on the podium, but he and his team should be incredibly proud of their performance. Battling it out, from east coast to west, were Mark McCrowe (St John’s), Renée Lavalée (Halifax), Antonio Park (Montreal), Patrick Garland (Ottawa), John Horne (Toronto) Luc Jean (Winnipeg), Chris Hill (Saskatoon), Milton Rebello (Regina), Dave Bohati (Calgary), Ryan O’Flynn (Edmonton), and Kristian Eligh (Vancouver) — each were winners in their respective citys at the regional Gold Medal Plates culinary cookoffs. The national competition began on Thursday night with the presentation of a mystery wine and an envelope of cash. 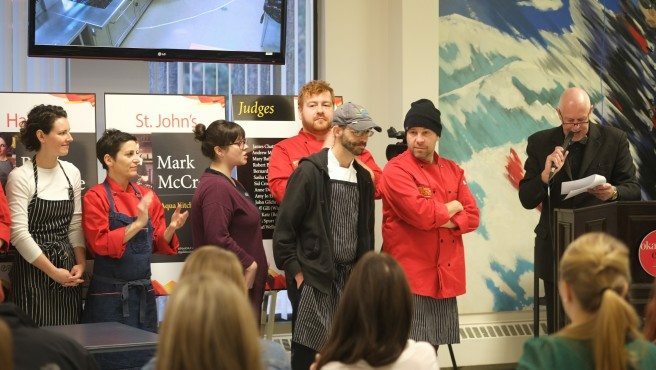 Each chef was given $600 with which to purchase ingredients from Kelowna shops to create roughly 500 small plates for the Friday night crowd and a further thirteen for the judges. So a bit under a buck twenty per person. We ate quite a few beets, which happened to go very well with the mystery wine. It turned out to be the 2012 Pinotage from Stoneboat Vineyards (Okanagan Valley, BC). The winning chef ended up using beetroot six ways on his plate. One chef gave us a beet and barley salad. 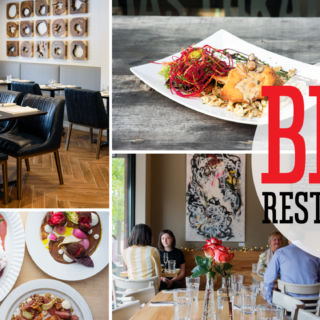 Two chefs found blueberry notes, others smoke, and created plates with those flavour elements. The Absinthe team — who figured out the wine, clever them — chose to make an Irish stew, braising lamb shank with warming spices (clove, cinnamon) and spooning the soft meat on a peppery rosemary-scented biscuit. The rich jus on the plate was a reduction of the wine, with the added campfire flavour of smoked hock. Tucked beneath the biscuit and meat, a refreshing salad of snap peas, tarragon, and slivered fennel — a welcome belt of crunchy green. A perfect parmesan tuile lent the salty, rich umami the wine demanded. Saturday morning, a bus load of bright-eyed chefs, sous chefs, and knife kits headed to Okanagan College kitchens for the Black Box competition. In past years, the six items found in the BB were all used to fashion two dishes. This year, the box was bigger. In it were ten ingredients, of which the chef was invited to choose any six, and make one plate for each judge. What was in the box? 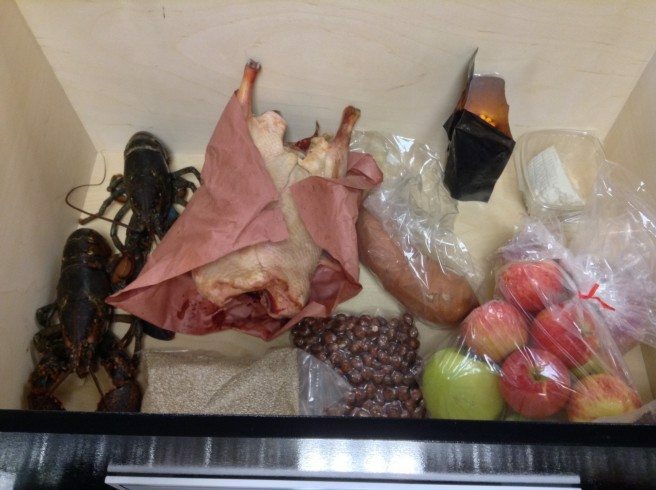 Yams, fresh ricotta cheese, a bag of lavender, turnips, Golden quinoa, BC hazelnuts, seabuckthorn berries, Okanagan apples, a whole Muscovy duck, and two lobsters. This was the year of pickled things on plates — the charcuterie craze, you know — and though one chef made pasta, another a soup, we had a lobster salad, and a couple played with surf and turf, most chefs handed us plate after plate of seared duck breast and puréed yam. Garland was chef number eight to lift the lid on the Black Box. 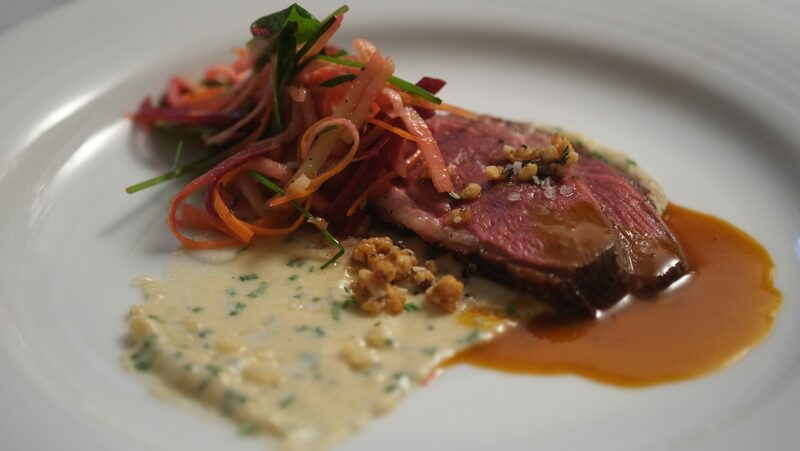 He worked with Absinthe sous chef Mark Currier, choosing the duck breast, turnip, ricotta cheese, apples, hazelnuts and those brilliant orange seabuckthorn berries with which he fashioned a gorgeous gastrique. He made a purée with the turnip and ricotta — into which he folded the (chopped, toasted) hazelnuts. His duck breast was seared, served very rare, and scented warmly with star anise, fennel, and cinnamon. Next to the duck, a perky, colourful slaw with beets, carrots, turnip, and apples. The final element on the plate was a very successful hazelnut brittle, lightly sweet and scented with rosemary. Last night, at the finale, all chefs recreated the winning dish that had earned them a berth at the CCC, paired with the same wine. 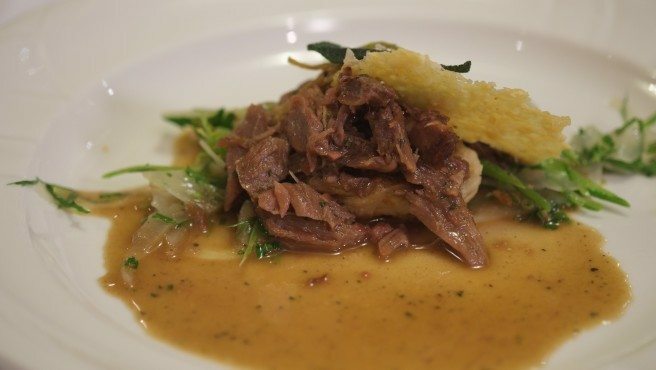 For Pat Garland that meant the Tawse 2013 Quarry Road Gewürztraminer (Vinemount Ridge, ON) with his quail two ways — the breast stuffed with foie, the thigh beneath, braised and aromatic, then lightly panko-ed, served with grapes (“lovingly peeled”). 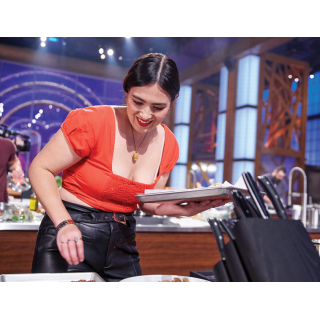 There were frittered rings of shallot and chewy cinnamon cap mushrooms on the plate, and wobbly jellied cubes of the wine (Garland told the judges he’d put “an ungodly amount of Gewürztraminer in the dish”) and in the reduction jus. It was a delicious plate of food and a great match with the wine — the saltiness of the fritter and panko crust tackling some of the sweetness in the Gewurzt. Congratulations to all the chefs. The cooking this year was highly accomplished. And I ate it all with great pleasure. Salads and green tea for me this week.